QuikQ, the leading provider of a cardless direct fuel connection between truck stop point-of-sale (POS) and motor carrier enterprise systems, today announced that Reliable Carriers Inc is using its Fuel Purchase System (FPS) to streamline the fueling process for its drivers. Reliable Carriers, based in Manchester, Tennessee, is a 48 state, irregular route contract carrier. Founded in 1981, the company hauls dry freight in high cube and specialized Ultra Cube trailers using 115 company owned tractors. More than 350 Love’s Travel Stops locations in 40 states are equipped with the QuikQ Fuel Purchase System, a direct connection between point-of-sale (POS) and motor carrier enterprise systems. For Reliable Carriers, RFID tags on tractors activate FPS-enabled fuel pumps at specially equipped lanes at the Love’s facilities. Drivers verify the information with a code, saving time in authorizing the fueling transaction. A privately held software development company based in Franklin, Tennessee, QuikQ creates and develops innovative fuel transaction processing solutions for motor carriers and truck stops. Redefining the entire fueling process, the QuikQ Fuel Purchase System (FPS) is the first fuel transaction software that is designed to manage the entire fuel transaction through real-time direct “carrier to truck stop” connectivity. 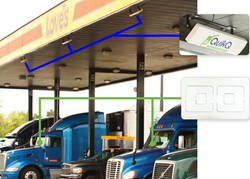 QuikQ’s RFID-based fueling system is currently being installed at truck stops nationwide and is being adopted by a growing number of motor carriers. For more information, visit http://www.quikq.com.